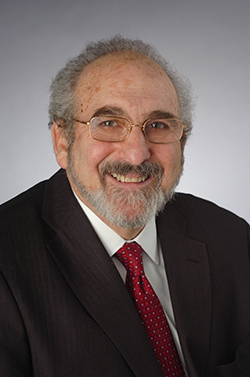 Eric R. Kingson, professor of social work in Falk College and a faculty affiliate in its Aging Studies Institute, was named the 2015 recipient of the Donald P. Kent Award from the Gerontological Society of America (GSA). The award, which will be presented at the 68th Annual Scientific Meeting Nov. 18-22, is given annually to a GSA member who best exemplifies the highest standards for professional leadership in gerontology through teaching, service and interpretation of gerontology to the larger society. It was established in 1973 in memory of Donald P. Kent for his outstanding leadership in translating research findings into practical use. A video honoring Kingson was done to coincide with the presentation. It can be viewed at https://www.youtube.com/watch?v=doDi1WYkmzg. Kingson was also recently named a Purpose Prize Fellow for his work on Social Security Works as founding co-director, along with founding co-director Nancy Altman, who was also honored. The honor comes from Encore.org, which recognizes the achievements of people who are working to improve local communities and the world. Encore.org is a national nonprofit that is building a movement to tap the experience of people in midlife and beyond who are using their encore years—the time of traditional retirement—to undertake powerful social-impact projects. Kingson is a past chair of the GSA’s Social Research, Policy and Practice Section as well as a fellow within the society. From 1984 to 1985, he directed GSA’s Emerging Issues in Aging Project, leading to the publication (with Barbara Hirshorn and John C. Cornman) of “Ties that Bind: The Interdependence of Generations” (Seven Locks Press, 1986) and a companion report, “Investing in America’s Families: The Common Bond of Generations” (1986), which was the basis of a hearing by the House of Representatives Special Committee on Aging. An affiliated researcher with the Center for Retirement Research at Boston College, he is co-founder of Social Security Works, which launched and staffs the Strengthen Social Security Coalition that he co-chaired through June 2015. A founding board member of the National Academy of Social Insurance, he served as policy advisor to the 1982-83 National Commission on Social Security Reform and the 1994 Bipartisan Commission on Entitlement and Tax Reform. An active volunteer on the Obama Campaign’s Retirement Security Policy Advisory Committee, he later served on the advisory committee to the Social Security Administration’s transition team. His most recent book (with Nancy Altman) is titled, “Social Security Works: Why Social Security Isn’t Going Broke and Why Expanding It Will Help Us All.” An author of articles and books for both academic and general audiences, Kingson studies, researches and writes about the politics and economics of the aging of America, retirement, interdependence of generations and the future of Social Security.